Open concept homes remain popular amongst homebuyers today, and it’s easy to see why. These layouts make homes seem even more spacious and allow families to spend time together without being cramped into one room. And while open concepts are great for entertaining or to keep an eye on the kids while you’re cooking dinner, they don’t always give you much privacy when you need it. Here are some simple solutions to help you add privacy to your open concept home. Sliding barn doors have become a popular design trend in the last few years, and they work well in open concept homes. They can be used in the kitchen to help separate the space while you’re cooking, but easily opened when you want it to feel more expansive. Take it a step further and use doors made of a translucent material. You’ll still be able to let in the light without sacrificing any privacy. You can create additional privacy in the kitchen by adding a second tier or raised bar to your island. While it doesn’t wall you off completely, it does give you a bit of separation from guests and can help to hide things like dirty dishes. It’s a great way to keep the kitchen looking clean and tidy without all the effort. You can create more privacy at will by using room dividers. This can be something as simple as hanging curtains from the ceiling that can be closed, or you can go for a more permanent solution by strategically placing bookcases to section off the part of the room where you’d like more privacy. 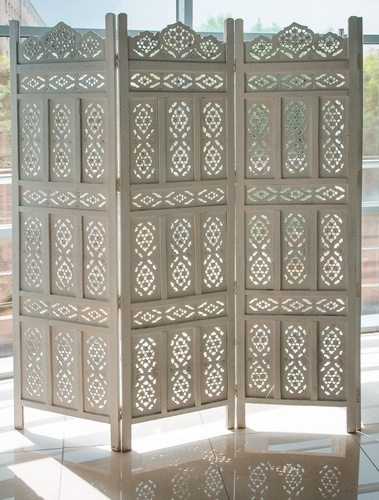 There are so many choices when it comes to creative room dividers; your imagination is your only limit. You can easily create the illusion of more intimate spaces in your open concept home just by arranging the furniture. Instead of splurging on a massive sectional sofa for your living room, you can make smaller spaces that have a more intimate feel. Position a couple of accent chairs facing each other, along with a small table and a rug, and you’ll suddenly have a nook that’s perfect for quiet conversations. Another way to create a sense of privacy in an open concept home is to use lighting. Ditch the overhead light and opt for a layered lighting approach, with a combination of floor lamps, table lamps, and accent lighting. When you want to create a more intimate space, only light the area you’re using and leave the rest of the space dark. Not only will it feel more private, it’ll be cozier, too. Finally, much like light, plants can be an easy way to create privacy while also making your home more beautiful. Large plants can be used like room dividers to help delineate and add privacy to a space. You can also add plants to half walls in order to extend them and help block the view.